The Guest House provides accommodation for SPring-8/SACLA users during their stay. To stay at the Guest House, users need to make a reservation in advance (See below). The Guest House is intended for short stay for beamline users; therefore, vendors, visitors for facility tour, and family members are not allowed to stay at the Guest House. The Guest House guests are prioritized in this order. When the Guest House is fully booked with public/contract/RIKEN BL users 10 days ahead, participants of on-site conferences/workshops/meetings, or NewSUBARU experiments will be asked to cancel their bookings in the order of their late bookings. Project leaders are required to submit an “Application Form for SPring-8 Facilities” online from My Page to make visit arrangements for all team members at least 10 days prior to arrival. If you wish to stay in a twin room (Guest House C & D), please see the sample request form as follows. Request your host researcher/secretary to make a reservation online through the Guest House Reservation page. Organizers of conferences, workshops, etc. are responsible for making guest house reservations for participants; so, please follow the instructions given by the organizer. With the increase in the number of users, the Guest House has always been full with a long waiting list. If you need to cancel your reservation, be sure to notify the Users Office or the Guest House front desk immediately, so that as many users as possible can stay at the Guest House. – According to the reservation, we will book twin rooms of building C for single use. – If you do not request the twin room for single use, contact the front desk of Guest House. When they have trouble reaching you, the room will be offered to the next person on the waiting list. You are strongly encouraged to leave your cell phone number/address, so that they can reach you as soon as a room becomes available. If you wish to be removed from the waiting list, please make sure to contact the Front Desk. [Check-In] Please check in between 4:00 pm and 10:00 pm. When you cannot arrive in time for your scheduled check-in time, please contact the front desk or the Users Office in advance. Failure to do so may result in cancellation of reservation. [Check-Out] Generally, checkout time is between 7:00 am and 10:30 am. At the time of check-out, please return the IC card and vinyl case and make payment in cash. If you require a earlier or later check-out, please advise the front desk beforehand. [Room Rate] The rate for a single room in Guest House A & B is 2,000 yen per night and a twin room in Guest House C & D is 3,000 yen per night (the bill cannot be split). Please note that the full room rate is charged for late check-out after 3:00 pm. Please make payment in cash (Japanese Yen) or by credit card (VISA or MasterCard only) at the time of check-out. [Amenities] The Guest House Reception building has a lounge, small kitchen, Japanese-style room, vending machine (for drinks, light meals such as cup noodles and retort-pouch foods, razors, detergents). And each Guest House building has a kitchenette, laundry room, and vending machine for drinks. [Items Available for Checkout] Bicycles and irons are available from the front desk. [Guest Room] All guest rooms are IC card operated. To unlock the room door, make the IC card touch the card reader on the doorknob, and the blue lamp lights up. The door locks automatically, so please take the IC card with you when you leave. Since we do not have spare IC cards, please protect the IC card from being damaged or exposed to strong magnetic fields. Guest rooms have a single bed, desk, table, chair, and electric kettle, and are equipped with an air conditioner, telephone(for an extension only), refrigerator, and TV. Hand soap, shampoo, toothbrush, toothpaste, towels and tea are also available. Please note that the removal of room items is not allowed. Smoking is prohibited on the balcony as well. To activate the power of the air conditioner and room lights, insert the IC card into the card holder by the door. During your stay, your room will be serviced every three days. (Clean towels are also available at the front desk. Please place used towels in the box located next to the front desk.) If you do not require your room to be serviced, hang the “Do not disturb” sign on the door. To request a change of linen only, please advise the front desk. There are five wheelchair-accessible rooms in the Guest House B. If you require a wheelchair-accessible room, please make a request at the time of the reservation. Wireless Internet access is available in the guest rooms. For details, please refer to the Internet Access at SPring-8. The kitchen is located in the Guest House Reception building and cooking equipment such as kitchen stove and microwave, and tableware such as plates and cups are available. When you wish to use the kitchen, please contact the front desk. When using the cooking heater, please follow the directions for use. [Japanese-Style Room] There are two Tatami (Japanese-style) rooms in the Guest House Reception building (twelve-mat room and eight-mat room). These rooms can be used for meetings as well. If you wish to use the room, please contact the front desk. [Kitchenette/Laundry Room] On each floor of the Guest House building, there is a kitchenette and laundry room for common use. The kitchenette is equipped with a kitchen stove and a microwave. Please be careful with fire and be sure to clean up after use. The laundry room is equipped with a coin-operated washer and a dryer. Detergents are available from the vending machine located in the Guest House Reception building. [Medical Supplies] Home medicine, a wheelchair, and an automated external defibrillator (AED) are available at the Guest House Reception building. A stretcher is available at the lobby of each Guest House building. [In Case of Emergency] In case of fire or any serious medical emergency, call the front desk at Ext. 8181 when you are in the Guest House. When you are outside the Guest House, please call Ext. 119 and give your name, telephone number, and the nature and location of the emergency, and describe the situation. Please stay on line until you are instructed to hang up. The security guard posted at the Main Gate calls the fire department. The cafeteria is the only space to eat on the SPring-8 campus. Please use the cafeteria to take a break during experiment as well. The cafeteria offers a selection of food: Japanese, Western, and Chinese food, noodles, curry, etc. Payment has to be made by a rechargeable prepaid card. Please load money onto the card using the machine (cash only) located just inside the entrance before use. When using the machine, please follow the instructions indicated on the machine. The Reference Room is located adjacent to the A2 door of the Storage Ring building and available to users around the clock. Only in the Reference Room, staffs or users can search or look through books and scientific journals. The Reference Room also offers database services by which you can search the JCPDS data files (database for X-ray powder diffraction files, trade name: PDF-2) through the computer in the Reference Room. For details, please visit the Reference Room Website. The Health Office is located adjacent to the D3 door of the Storage Ring building. 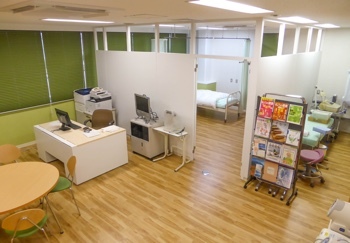 The Health Office has two beds for emergency use (Leave your name in the guest book after use), a wheelchair, body fat monitor/scale, blood pressure meter, optometer, and health-related books. From 9:00 to 17:30 on weekdays, the nurse (Ext. 3299 or Ext. 999) will give adequate first aid to the users who get sick or injured during experiment. The users can also get home medicine at Guest House Front Desk (Ext. 8181). AEDs (automated external defibrillators) are located outside the doors to experimental hall (A1, B1, and C1) and in the Health Office. First aid kits are placed outside the doors to experimental hall (A1, B1, and C1). Stretchers for sick and injured people are available in A1, B1, C1, and D1 areas. For further information, please contact the Health Office at Ext. 3299 or Ext. 999. The gymnasium consists of the arena where users can enjoy volleyball, basketball, futsal, badminton, table tennis etc., training room, changing rooms and shower rooms. If you wish to use the arena, please contact the Personnel Section, General Affairs Division at Ext. 2122. The gym is available until 10:00 pm. An AED (automated external defibrillator) unit is located at the entrance. Shop Kirari is located in the cafeteria building and open from 10:30 am to 8:00 pm on weekdays and from 11:00 am to 2:00 pm on weekends during user beamtime only.The store has light meals such as box lunches, bread, sweet buns, and sandwiches, snacks, daily necessaries, stationery, newspapers/magazines, West Harima’s local specialties, SPring-8 gift items, etc. Copy and fax services are also available. Other ATMs are available at the Kouto Plaza. The nearest bus stop is “Shibafu-hiroba”. You can use your credit card (VISA, AMEX, MC, JCB) to get cash in advance.